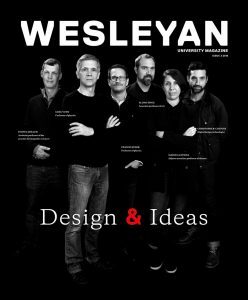 The Andrew W. Mellon Foundation awarded Wesleyan’s Center for the Arts a $750,000 grant to support the Creative Campus Initiative and the Institute for Curatorial Practice in Performance (ICPP)—another major grant for the CFA (see page 9). Half a million dollars of the $750,000 grant will be matched by $1 million to be raised to endow continued cross-disciplinary Creative Campus activities. With support from Wesleyan alumni, the fundraising campaign to meet this challenge is being launched on the occasion of the 40th anniversary of the CFA during the 2013–14 season. The grant will support the development of new work by a range of diverse artists, interdisciplinary collaborations, co-teaching initiatives, and arts-based campus-wide projects of the Creative Campus Initiative, as well as the ICPP, the university’s post graduate program. The event on July 25 will underscore ICPP’s commitment to the evolving field of performance curation and will affirm its role as a leading proponent of curatorial inquiry, addressing contemporary performance through a variety of institutional platforms and intersections with other disciplines. Designed for presenters, curators, artists, and members of the cultural community, the day-long symposium will include panel discussions, artist lectures/performances, and interactive work sessions. The Mellon Foundation previously awarded the Center for the Arts a grant in July 2010 to help support the expansion of the Creative Campus Initiative’s cross-disciplinary exchanges, development of new courses, and student engagement in a wide variety of opportunities to make, experience, and understand art, as well as to support the planning and partial funding to launch the Institute for Curatorial Practice in Performance to enhance professional practice in the presenting field. The goals of the Creative Campus Initiative at Wesleyan are to provide arts experiences for students that illuminate issues of cultural and societal concern; to allow students to integrate arts research and practice into their work in other disciplines; to provide non-arts faculty with the tools to involve integration of artistic research methods and modes of inquiry; and to support artists in theater, music, and dance who work with scholars and materials in non-arts areas in ways that will advance the artists’ own research and extend the arts into new areas of campus curricular and co-curricular life.